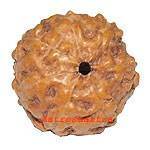 Seven Mukhi Rudraksha governs Planet Saturn and it symbolize Goddess Lakshmi . It is termed as Anant representing seven covers- Earth, Water, Air, Fire, Aakash, Agni and Darkness. Its Lords are Saptrishi and Devi Laxmi. Its use blesses the native with wealth, respect and spiritual power. It pardons serious sins like cow slaughter and theft, smuggling etc. 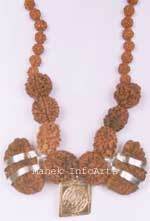 This is worn on a Monday morning after rituals in gold/silver chain or in black thread. This is very auspicious for natives born in Aquarius Lagna. One can keep it in cash box instead of wearing. It has the blessings from powerful Shani Bhagwan. 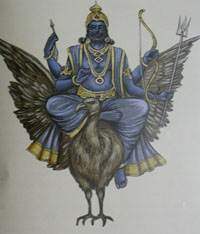 When worn it sublimates the malefic effects of Shani and its disease like, impotency, cold, obstructions, hopelessness, delay, chronic disease, scarcity, worry etc. Its lords are Sapt Rishi and devi Lakshmi. It helps in building finances and amassing wealth. It is considered very auspicious because it helps ward off fatal diseases and death and achieve longevity. 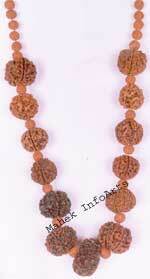 Wearer of this gets wealth, fame and spiritual knowledge. It is said that poverty and wants never touch its wearer. According to the Vaishnava traditions, it represents Avanta (Shesha), the king of serpents. Each face of seven faces represents one great serpent. These serpents are Anantha, Kakata, Pundarika, takshak, Visholban, Karisha and shankhachuda. These very powerful serpents live in each face. 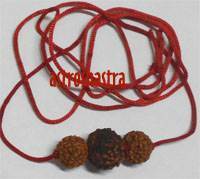 Snakes never harass the wearer of this Rudraksh bead. The lord of serpents, Shiva has special grace on the wearer. Due to grace of lord Shiva such a person is not affected by sins. Such a person gets all the merits befitting goals. 1. Improvement of Business and of cash. 2. Remedy for sade-satti of Saturn . 3. Wearer enjoys marital happiness. Saturn indicates areas that we have to focus and develop responsibility. Develop inner strength and capacity to bear the hardship of life. Develop strict inner discipline but without repression of the human love and compassion. Learn to be humble, work hard and serve other people as a duty, without feeling humiliated or expecting nothing return. Practice of concentration, austerities , fasting and seclusion for spritual strenthening. When Saturn is afflicted it indicates, skeptical, melancholic, deceitful, incompetent, wearing it pacify the malefic of planet Saturn. 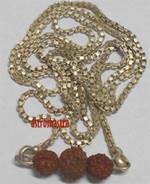 People running under the Mahadasa of Saturn or Anterdasa of Saturn shall wear it. In sade sati of Saturn also it is very effective in controlling the malefic effects of Saturn. It is one of the best remedy for Saturn. It shall be worn on Saturday or monday morning. After morning rituals, it should be washed with ganga jal or panchamruit and worshipped and worn in Gold, silver or in black thread, while facing North or east. It can be worn with any other bead. The wearer should recite one mala japa daily of either of the two mantras.
" 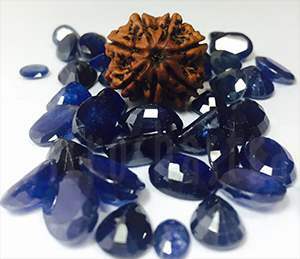 Om Hram kreem hreem Soung"
It is very effective if worn with Blue Sapphire, Lapiz Lazuli, Amythest, Shani Yantra, Bhairon Yantra, Vashikaran Yantra silver pendant. It should be worn only after being energized by its mantras. The following mantra should be recited 550 times before wearing it.